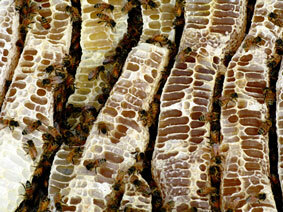 Bees are natural workers and organisers, and hives which are healthy are largely self sustaining. 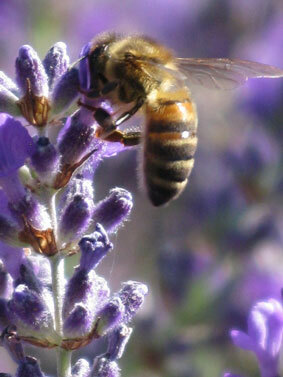 Snowy River Lavender’s honey bees live full time on the farm working the seasonal blooms, native, wild and farmed. 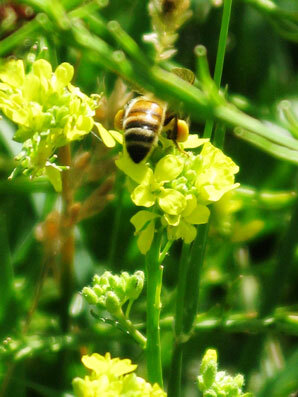 The bio-diverse environment the bees live in means the honey produced can be the result of multiple floral sources. We distinguish our honey by the seasons and the dominant flowerings responsible for a honey flow. A honey flow occurs in times of floral abundance when the bees produce more honey than can be used for their own sustenance and we only take honey at this time. 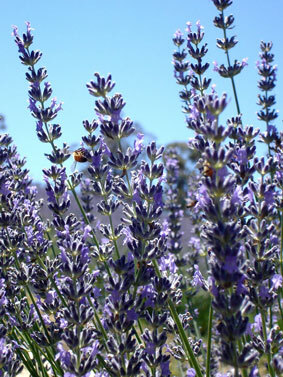 Our summer honey flow is a yearly event due to the abundance of lavender flower we farm and distil for essential oil. Our spring and autumn honey flows are occasional events, dependent on climatic conditions and nature’s seasonal bounty. There are tens of thousands of worker bees in a healthy hive each one with its job to do in maintaining the productivity and sustainability of the hive as an organic entity. One cannot help but respect this innate sense of industry these tiny creatures have. With many and increasing acres of lavender in bloom thru the summer months this flower is regarded the dominant floral source for our Summer Honey. Bees and lavender are a beautiful synergy we all feel privileged to witness. Lavender provides nectar and pollen to the bees and the bees promote plant reproduction starting the hormonal reaction seminal in each flower’s seed set the process which also facilitates the flowers yield of essential oil. There is a 15 day window after the bee visits the flower when the essential oil yield is optimum, this is a major factor in determining when to harvest. As well as the essential oil, honey is another beautiful outcome of this union we can all enjoy. We have not had our honey tested and the farms biodiversity means that we can’t guarantee species specific honey however anyone visiting the farm in summer and seen the bees at work can be in no doubt that lavender is the primary contributor to our honey harvested at this time of year. Our Summer Honey is liquid amber with a refined sweetness and a lemony, ‘lavendy’ depth. If kept cool our Summer Honey granulates to smooth buttery, fudge like consistency. In summer bee activity on the lavenders is prolific. Look closely and you will see the tell tale amber blurs on any photo you take at this time of year. 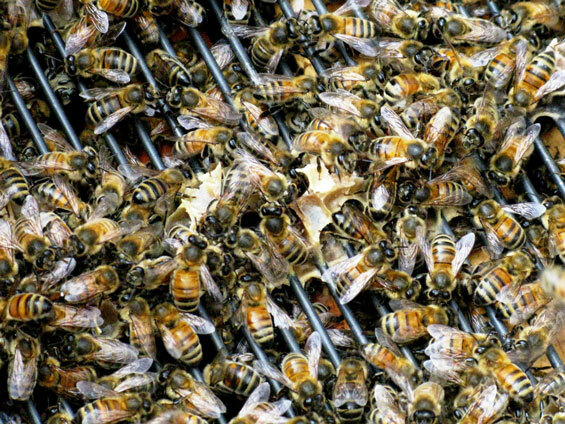 While having a stable life on the farm is positive for the bees in that it limits hive stress and potential for disease. However, this factor also means the hives fortunes fluctuate with the climatic conditions and its impact on the plants within the farms landscape from which their forage is derived. For most of the year, even if forage is not enough to produce a honey flow, there is usually enough, for the hives to be self sufficient in maintaining their strength. We leave a full box of honey, built up through the summer, to sustain them through the often freezing winter months. Monitoring the availability of forage and the productivity of the queen are central to our hive management practices, both are important factors in maintaining the strength of the hive. 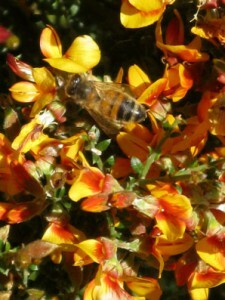 Bees collect nectar and pollen, and make and store honey, for their own nourishment. During seasons when flowers are abundant we check the hives at regular intervals so we can determine when a honey flow has occurred and this is the only time we harvest honey. 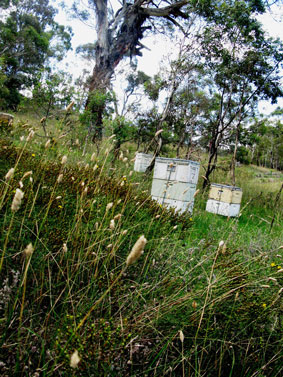 Hives at Snowy River Lavender - the bottom box is the brood box where the queen and bee nursery resides. The top boxes are called honey supers where the worker bees hoard their honey. Robbing hives in late summer with the harvested lavenders evident in the background. 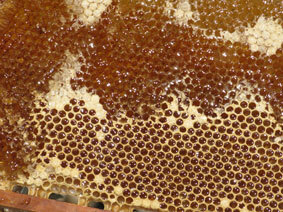 This photo shows a fully capped frame of lavender honey. Our honey production is small scale and our extraction facility is similarly modest however we believe our processes produce a high quality product. The honey we produce remains in its raw state because we use cold extraction methods and minimal processing. The only heat used in this process is the de-capping, a process where the fine film of wax covering the honeycomb is cut away so the honey can be released into the extractor. The cappings removed are melted down into high grade nuggets of buttery gold wax useful for soap and cosmetic products. 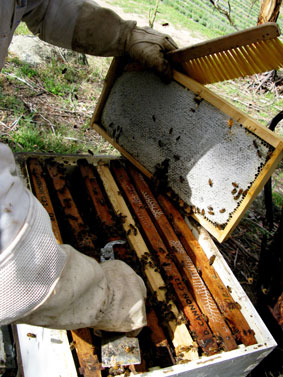 Once the honey frame has been de-capped it is placed, 2 frames at a time, in our manual extractor. Extraction is based on centrifugal force with the honey spun out into the extraction barrel ultimately slipping down the barrel walls to the base where it accumulates to be gated out when sufficient amounts warrant this process. Finally as the honey is gated out of the extractor it is strained twice for clarity and stored in food grade 25 litre plastic buckets then lidded and cellared until it is finally sold or utilised in our body care products. The amber glisten of uncapped honey. This frame is ready to go into the manually powered centrifugal extractor. 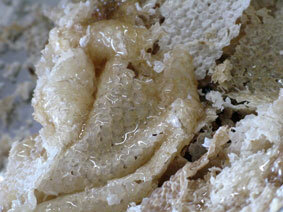 Wax cappings removed from a honey frame before extraction. 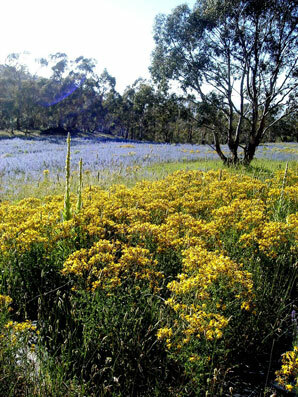 Floral sources of honey flows on the farm include rosemary (Rosmarinus officinalis), Silver Wattle (acacia dealbata), Mountain Merbelia and SubClover in early spring;Snowgum (Eucalyptus pauciflora), briar rose (Rosa ruginosa), Vipers Bugloss (Echium vulgare), Kitten Clover, Clover and Buchan late spring to early summer; Lavender, Lavandin, Vipers Bugloss, St Johns wort, and Mullien mid to late summer; and Eucalyptus, (viminalis and rubida) and Grevillea (rosmarinafolia, victorea, juniperina and diminuta) in autumn and winter. While these flowerings can overlap in different combinations according to climatic factors, all these plants contribute to the unique floral combinations that create our beautiful honeys. We do not produce a lot of honey and it is of limited supply. We sell some table honey to those interested in this boutique product. However, increasingly our bee’s production, both honey and wax, is being utilised in our premium personal and home care products. 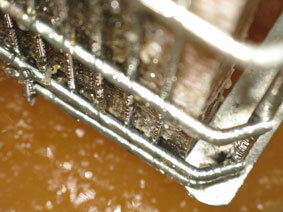 Extracted honey dripping down into the extractor barrel ready to be gated and strained. Free form honeycomb found in the lid of one of our hives. The bees have their natural ways often different to the artificial production processes we put on them to make it easier for ourselves. Mountain Merbelia is abundant in the farm’s forests in early October and is one of the forage species the bees turn to build hive strength after the scarcity of winter. Spring is the time of year when the winter pasture’s mellow tones give way to the vibrant greens of new growth. 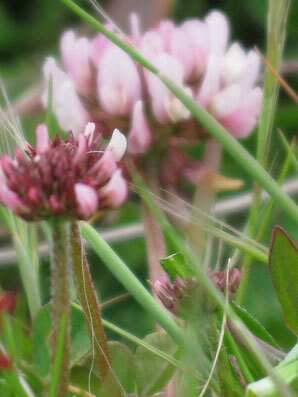 Pasture, is a study in biodiversity with many flowering plants integrated amongst the grasses. Clovers are central in this bio-diverse sphere and provide nutritious forage for our bee population, often for a prolonged period extending from early spring right through the summer months. The brasica Buchan is another flowering pasture plant the bees love. Note the golden sacks of pollen on this bee’s hind legs. Summer field flowers, Vipers bugloss and Saint John’s Wort and Mullien, are naturalised species which add biodiversity to the bees’ available range of forage. While many of these plants are deemed weeds, and controls are mandated by local authorities, most of these plants are ancient medicinal herbs whose usefulness we, in general, no longer respect – Except of course the bees!